The world is hooked on plastics, but creating plastics — especially thermoplastics like nylon, polyethylene, and polystyrene — typically requires petroleum or natural gas. That’s bad, because it deepens the world’s dependence on those finite resources. Researchers at the Institute of Agriculture & Natural Resources at the University of Nebraska – Lincoln have presented new research at a meeting of the American Chemical Society that purports to have found a way to create durable thermoplastics from chicken feathers. The new technique is an advancement over previous efforts in that it performs well when wet. “Using this technique, we believe we’re the first to demonstrate that we can make chicken-feather-based thermoplastics stable in water while still maintaining mechanical properties.” says Yiqi Yang, Ph.D., the study’s leader. 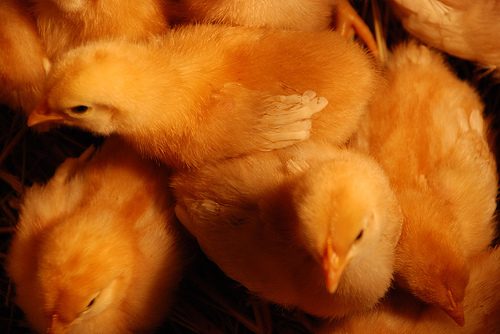 Chicken feathers are an excellent prospect, Yang explained, because they are inexpensive and abundant. Few shoppers think about it, but every shrink-wrapped broiler in the supermarket cooler leaves behind a few ounces of feathers. Annually there are more than 3 billion pounds of waste chicken feathers in the United States alone. These feathers can be processed into a low-grade animal feed, but that adds little value to the feathers and may also cause diseases in the animals. All too often, they become a waste disposal/environmental pollution headache, incinerated or stored in landfills. It’s not clear how many feathers are used per unit of thermoplastic, so it’s not clear how much of a net savings this is for the world at large, in terms of using renewable resources, but it sounds like an excellent step in the right direction.